Most medical treatises written in 1904 would rarely seem relevant in any contemporary discussion of health and wellness. After all, is it not the case that the most popular explorations into the secret to wellbeing and happiness depend precariously on some sort of scientific discovery? Surprisingly, and out of the pages of history, Hatha Yoga by Yogi Ramacharaka offers a scientific and spiritual answer to many current health and wellness questions. Within the pages of this 110-year-old text are explorations of the correlation between the mind and body—analyses of the synchronic relationship between energies, thoughts, and mental attitudes and their physical manifestations. Rather than delving into a list of common ailments and their scientific root cause, this book reshapes the perception of health and wellness from a focus on disease, to a focus on maintaining balance and order in the natural state of existence. Here, the body serves as a vehicle, as a Temple of the Spirit, to be used as an instrument of soul growth. Yogi Ramacharaka points to two Principles of the Vital Force that guide one’s state of health. The first is Self-Preservation, which “moves us along in the direction of health, as surely as does the influence within the magnetic needle make it point due north.” (26). The second is Accommodation, meaning our constant navigation through the ever-increasing technological and industrial complications that distract the body and mind from its natural state. We are living in a time where natural living becomes disturbed. Sleep, stress, eating, and health are all out of balance and prioritized improperly. Instead, we must allow the Vital Force to flow freely through the body, in the most natural of ways, returning to the most basic, simple, and undisturbed way of nature, in order to decrease the gap between the mind and body. Eliminating the dichotomy between mind and body, or spirit and form, will allow for a more synchronous life. As the mind and body become one—adopting the natural order of things whereby the body acts as a conduit for the spirit—the Vital Force igniting one’s existence will blossom. The chapter titled, “The Laboratory of the Body” deals with the most fundamental physical elements of the human form—teeth, salivary glands, tongue, stomach, blood, skeletal system, and so on. Yogi Ramacharaka points to the importance of understanding the functionality of the body, as one needs to maintain the machine in order to attain a higher spiritual state of mind. As such, several chapters are dedicated to the structure and functions of the body, paying particular attention to the intended functions of the digestive, circulatory, and breathing systems. All three are explained pseudo-scientifically, bearing both diagrammatic and spiritual descriptions. As such, these sections connote the proper and improper uses of the body, highlighting the negative effects of improper digestion, circulation, and breathing. Most poignantly, Yogi Ramacharaka describes the fermentation and putrefaction of unmasticated food particles left to rot in the stomach—the consequence of hasty eating and gluttonous consumption habits. Furthermore, this submission to appetite rather than true hunger leads to the transmission of said rotten particles into the circulatory system—permeating negative energy throughout the body. In order to combat the circulation of putrefied elements and negative energy, Yogi Ramacharaka points to an essential principle of Hatha Yoga used to harness positivity and channel the abundant Life Forces—Prana. “Prana is the name by which we designate a universal principle, which principle is the essence of all motion, force or energy, whether manifested in gravitation, electricity, the revolution of the planets, and all forms of life, from the highest to the lowest. It may be called the soul of Force and Energy in all their forms, and that principle which, operating in a certain way, causes that form of activity which accompanies Life” (158). “You know the sensation which one sometimes feels when in the presence of a highly ‘magnetic’ person—that indescribable feeling of the absorption of strength or ‘vitality.’ Some people have so much Prana in their system that they are continually ‘running over’ and giving it out to others, the result being that other persons like to be in their company, and dislike to leave it, being almost unable to tear themselves away” (68). This sensation of abundance in both body and spirit is the goal of Hatha Yoga. Moreover, is it not the goal of every human being to feel fulfilled? To be abundant in one’s own sense of calm, strength, vitality, and life—so much so that we may share this gift of wholeness with others? The next portion of this treatise deals with the physical exercises involved in maintaining the physical body, not just for nourishment. Yogi Ramacharaka first describes the nature of correct and incorrect breathing—the former: using the entirety of one’s lungs (high, middle, and low), the latter: breathing against the chest and collar causing tension and straining the delicate lungs. After the correct method is established, relaxation breathing is described as a form of generating, maintaining, and recharging pranic energy. Once one has mastered breathing exercises, one must turn to the physical poses most commonly associated with yoga practices. Not only do they involve stretching, but they also deal with strength and muscular stimulation—though, as Yogi Ramacharaka wisely points out, strength is not an attribute of the vain and narcissistic, but an essential quality of every healthy, centered being. The last portion of this book deals with rest, rejuvenation, as well as mental and spiritual freedoms. It moves beyond the descriptions of the body’s natural state and step-by-step instructions on how to maintain it. Rather, it moves into the realm of the spiritual, whereby one’s energy manifests itself positively or negatively in the body. “The material body is but temporary, and the body itself nothing more than a suit of clothes to be put on, worn, and then discarded, yet it is always the intent of the Spirit to provide and maintain as perfect an instrument as possible.” (250). “Let us return to nature, dear students, and allow this great life to flow through us freely, and all will be well with us. Let us stop trying to do the whole thing ourselves—let us just LET the thing do its own work for us. It only asks confidence and non-resistance—let us give it a chance.” (255). I invite you to experience this book on your own, as an exploration into your unique inner-self. See what a few mere adjustments to your diet, breath, exercise, or even emotional elasticity will do for your health and wellbeing. Give it a chance. 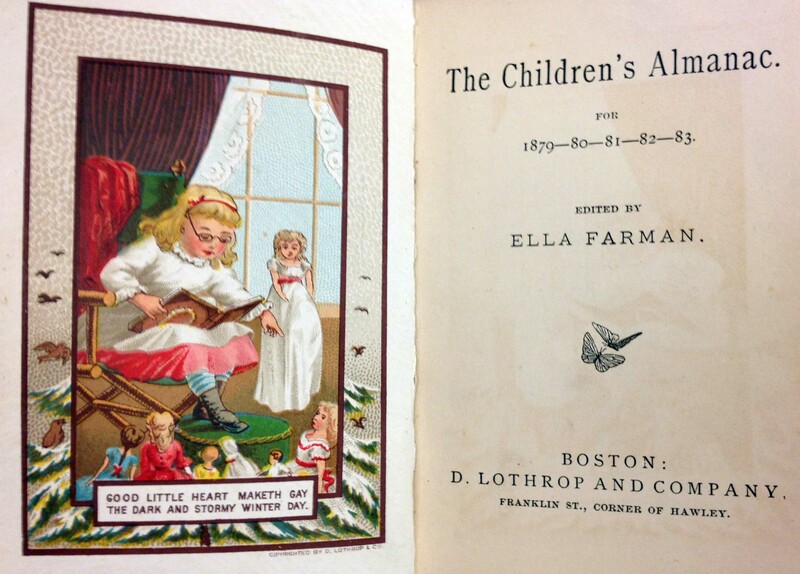 Ella Farman’s The Children’s Almanac for the years 1879-1883 is a beautiful, small book with a green cloth cover, embossed illustration, and gilt lettering on the cover. American almanacs are annual publications containing information such as weather forecasts, tide tables, planting and harvesting dates for farmers, astronomical information, and religious holidays. This almanac, however, is slightly different. It contains only eighty pages as opposed to most almanacs of the same time that could have many more. Farman’s almanac is also more of an anthology of poetry to interest the children reading it. On the first page inside is an inscription reading “Willie R. Witherle, Dec 25th, 1878,” either a dedication or the signature of the owner. 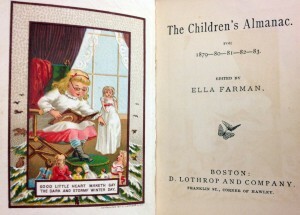 Opposite the title page is a beautiful lithograph of a young girl seated by a window reading to her dolls with a short phrase below: “Good little heart maketh gay the dark and stormy winter day.” The almanac is filled with phrases such as this in order to instill good morals in children. The book was published by D. Lothrop and Company in Boston and very much embodies the New England values of the late nineteenth century for the middle and upper classes. 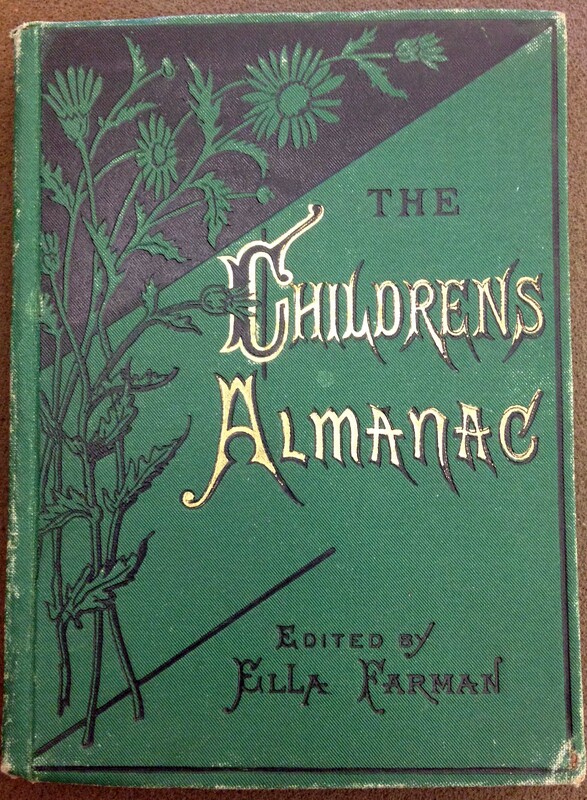 In Farman’s author’s note, she discloses the purpose of the almanac: a “little everyday book designed for a handy pocket reference and school-desk companion.” She intended for it to be a way children could learn and be reminded of the morals with which they were brought up. Just like an “adult” almanac, Farman divides hers into months for the years 1879 through 1883 almost as chapters, although she makes it a more appealing and interesting almanac as her audience is children. After the author’s note is a list of the original poets whose work Farman includes in the order in which they appear. Each month has its short own poem written by well-known literary figures such as Henry Wadsworth Longfellow, Celia Thaxter, and J. T. Trowbridge. A unique component to these poems is that their signatures are included at the end. The colorful lithographs that separate each season are beautifully detailed and Farman also includes intricate steel plate etchings for every month done by the engraver W.J. Dana in Boston. All illustrations depict happy children in various seasonal situations to engage children reading the almanac. Beginning January is a poem by Longfellow opposite a detailed engraving of a young boy and girl happily sledding down a snowy hill on a toboggan. On the next page are simplistic calendars for each year between 1879 and 1883 as references for the young minds for whom she wrote the almanac. Opposite the calendars are the “Daily Conduct-Mottoes” to which she referenced in her author’s note. For every day of January Farman includes a short phrase by important literary figures, some of whom also wrote the poems in the almanac. Farman wrote that she hopes the children will take heed of their Birthday-Motto but also pay attention to their Daily Conduct-Motto as an everyday reminder of how they should live their lives. She hopes they will keep these mottoes in mind each day in order to become as strong and true as the grandest men and women they can think of. She says, “Read it, hold it up high in your thoughts, and honor it in your deeds.” After the Conduct-Mottoes there is a blank page entitled Memorandia: Studies for the School Year for the children to keep their own thoughts and notes. With this, they can contribute to the almanac and perhaps be inspired by the poems or mottoes and write their own. Yet moored in the golden August weather. The poem perfectly embodies the month of August and the gentle language is appealing to children of every age. The lithographs after March, June, and September also contain phrases to instill children with the values they need to grow into strong and true men and women, of course reflecting the transition between seasons. The lithograph between June and July reads, “Never be idle, never be sad / Go in the sunshine and grow glad!” and depicts a small girl having a tea party with dolls, embodying the ideal summer afternoon for the target audience. The detailing of the lithographs is exquisite; they seem to glow as the carefully placed ink radiates the light off the page. Although the etchings are equally as detailed, the lithographs stand out in this almanac and would have certainly captured the children’s eyes. This almanac truly embodies the Victorian Era in America as it teaches children (of the middle and upper classes, of course) to uphold the moralities of the period. The advice, poems, and drawings are quite darling and the almanac, as Farman so intended, would have been the perfect book to store in a pocket or desk for daily reminders of these values. The children in possession of this almanac could certainly relate to the children depicted in the etchings and lithographs, as well as take pleasure in finding their birthday and the associated motto which they would hopefully, as intended, adhere to for all their lives. The Letters and Journal of Fanny Ellsler, Written Before and After Her Operatic Campaign in the United States, Including Her Letters from New York, London, Paris, Havana, &c. &c, [sic]. Published by H.G. Daggers, New York, 1845. Wikoff turned impresario by accident when the New York theater manager who had engaged Elssler for an unprecedented American debut died. Wikoff arranged for the ballerina’s debut on May 17, 1840 at the Park Theatre in New York City. From the next two years, over her repeatedly extended tour of the United States, he handled the bookings and contract negotiations, and served as publicist and company manager. She gave 208 performances, and received a then-astonishing fee of $500 for each. In this pamphlet, however, the ballerina’s surname name is misspelled, possibly due to a typesetting error (her surname was occasionally misspelled in Europe). The Watkinson’s copy of The Letters and Journal of Fanny Ellsler [sic] was purchased for 75 cents (slightly less than $19 in contemporary currency) at Anderson Auction Galleries in February 1909. A librarian noted on the title page “not in Sabin or Lowe,” indicating that this 1845 publication was omitted from standard American bibliographies a century ago. Possibly bibliographers of Americana had their sights set only on materials pertaining to colonial and revolutionary times. Most had no interest in the performing arts. Furthermore, ballerinas were widely considered but a rung above prostitutes, and their performances were considered entertainment for men. Delarue’s Fanny Elssler in America should be of interest to many bibliophiles of Americana, for it contains facsimiles of period publications and lithographs, including an early–and lengthy–comic strip. This and Ivor Guest’s definitive life of the ballerina (Wesleyan University Press, 1970) are invaluable in understanding the social, cultural, and historical forces at play in America during 1840-42. Although Elssler was admired by Henry Wadsworth Longfellow, Ralph Waldo Emerson, and President Martin Van Buren, in 1841 she was subject to a series of attacks from the press (notably Horace Greeley in the Tribune) and from the pulpit (Reverend Henry Ward Beecher). Her artistry, combined with Wikoff’s press support, squelched the anti-Elssler campaign. You are currently browsing the I Found It at the Watkinson! blog archives for April, 2014.